The Industrial Revolution brought significant development to Europe in the late 18th and 19th centuries, but it also increased the risk of diseases like tuberculosis (TB), which spread like wildfire among people living in close quarters in cities. Without a cure, TB was responsible for nearly one-third of all deaths in Britain in the first half of the 19th century. Now, bioarchaeologists are discovering skeletons that show some people lived a long time before the disease killed them. 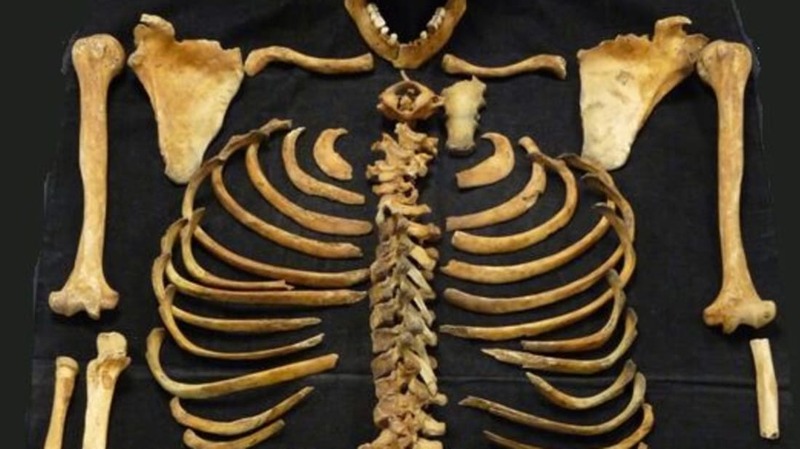 A new study investigates a skeleton of a young man who had tuberculosis in the early 19th century in Wolverhampton, England—and oddly enough, changes to his spine and ribs suggest he may have worn a corset. Tuberculosis primarily infects the lungs, but it can spread to bone through the bloodstream. The disease tends to concentrate in the vertebrae of the spine, because these bones are near the lungs, and because the pathogen likes the blood cell–producing tissues there. The infection of the spine often results in a hunchback deformity as the vertebrae collapse, known as Pott’s disease. Since TB couldn’t be cured and often progressed to deform the spine, men and women both wore corsets as an orthopedic device to correct postural issues. Of course, people also wore corsets for reasons of fashion: Women attempted to slim their waists and emphasize their hips and busts, while aristocratic men used them to show off their broad shoulders and narrow waist. Writing in the International Journal of Paleopathology, UK bioarchaeologists Joanna Moore and Jo Buckberry lay out the evidence from this skeleton, which was one of 150 burials excavated from St. Peter’s Collegiate Church overflow cemetery in 2001–2002. The cemetery was in use from 1819–1853; they couldn't pinpoint the time of the man's death any more precisely. His ribs had a weird angle to them on both sides—the result of something compressing them over time. While the vitamin-D deficiency rickets can cause this, there was no other evidence of that disease in his body. The spinous processes of the man’s thoracic vertebrae—those little poky bits you can feel along the midline of your back between your ribs—were also strangely positioned, angling to the left. Both types of bony deformities are consistent with compression from long-term corset use. But beyond the compression seen in the ribs and mid-spine, Moore and Buckberry found evidence of a life-threatening disease. All of the vertebrae in the man’s lumbar spine in his lower back had been damaged. The destruction was so immense in the first and second lumbar vertebrae that they collapsed and fused together, creating a significant bend in his lower spine. Similar destruction was present in the lower thoracic spine, where the vertebrae meet with the ribs. These destroyed vertebrae are characteristic of Pott’s disease and are almost certainly the result of tuberculosis. Moore and Buckberry found historical records from Wolverhampton that note that tuberculosis—also known as consumption, because people literally wasted away from the disease—was a significant factor affecting health and causing death in this area in the early 19th century. The rapid industrialization of the city had led to increased levels of air pollution, which in turn contributed to a rise in lung diseases like TB. So, this young 19th-century British man had tuberculosis and wore a corset. But the skeleton itself does not reveal whether he was a dandy who contracted tuberculosis or a consumptive who didn’t much care for fashion. The skeletal effects of fashionable garments and medical apparatus in men of the time period would be similar. Of course, as anthropologist Rebecca Gibson of American University, whose research deals with social and biological effects of corseting in European women of the 18th and 19th centuries, told mental_floss, "being a dandy and being a consumptive are not mutually exclusive." All that said, the link between TB and corsets is well established through both historical records and skeletal remains, so it is at least probable that this Wolverhampton man contracted TB and corrected his spinal issue with a corset. Perhaps most interesting, though, is that this is actually the first male skeleton ever found to have corset-related changes. Gibson says, "The deformation shown here is consistent with corseting damage seen in female skeletons." Although historical records clearly mention European men wearing corsets, prior to this study, the only skeletons shown to have corset deformities have been female. This lack of evidence may be related to the diminishing popularity of corseting among men in this time period, or it may be related to a lack of systematic study of male skeletons for corseting practices. Regardless of the reason for it, this new finding shows that bioarchaeologists should consider chucking gendered assumptions when looking at skeletons for corset wearing. What began as Moore’s student project on a skeleton curated by the Biological Archaeology Research Centre at the University of Bradford may now change the way bioarchaeologists look at the bodies of men from 18th to 19th century Europe. Now that we know that corseting evidence can be found on men’s bodies, more studies of this kind will increase our understanding of both Victorian medical practice and men’s fashion.